Why Did BFGoodrich Toss a Truck Tire Out of an Airplane? So let’s say it’s your job to do a little marketing for a new type of heavy-duty radial tire. Are you going to go all tire-geek and talk about stuff like pinch shock, tread puncture and sidewall splitting? Not if it’s real attention you want, you won’t. Better do something more interesting with that tire. Like, say, throw it out the back of an airplane. That’s what BFGoodrich did in an amusing promotional video released last week. Hoping to get off-roading fans pumped over its new T/A KO2 truck tire—billed as “BFGoodrich’s toughest all-terrain tire ever”—the brand flew a tire high into the clouds and then, just like that annoying Disney song goes, let it go. Since Goodrich wanted to show it makes the world’s toughest tire, the high-altitude fall was actually a thematic no-brainer. Even so, brand communications manager Duane Thomas told us, “As we led up to the production, there was still a knot in our stomachs." And well there might be. So called “stuntvertising” has become its own marketing genre in recent years, and much of it involves nauseating falls. Who can forget Red Bull’s sponsorship of Felix Baumgartner’s 2012 jump from the edge of space? In 2008, a publicity blitz called “Extreme Scrabble” found two skydivers playing the board game at 13,000 feet. But behind these marketing stunts is a story seldom told: How do brands cook up these ideas, anyway? And how do they manage the risk of something going wrong? 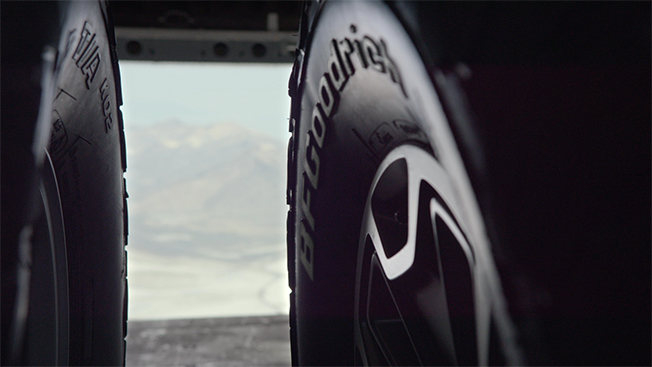 In the case of BFGoodrich, months of planning went into a video that lasted all of a minute and a half. As Thomas put it: “When you do a project this ambitious, you have to do some homework.” Say, for example, figuring out the height from which a regular production radial tire could fall without exploding on impact. “We worked with some physicists in trying to figure out the approach and how the tire could survive,” Thomas said. The answer: about 10,000 feet, which would still result in a falling speed of roughly 150 mph. on impact. As a backdrop, BFGoodrich’s marketing team chose the rocky wilds of Stansbury Island, Utah, mainly because its craggy landscape resembled the sort of unforgiving terrain off-roaders dig. But when you drop a tire from nearly two miles up, how do you know where it’ll come down? Well, you don’t. To make sure nobody got squashed by a falling truck tire, “we had to clear out a radius of couple of miles,” Thomas said. The extreme height and unpredictable odds also required BFGoodrich to compensate in other areas. It actually dropped four tires, not one. The company also had scouting teams of photographers on the ground and an all-important one in the air. “We worked with a world-class skydiver who followed the tire out the back of the plane,” Thomas said. His was the footage The Martin Agency later made into that cool, surreal video.